A team of hardy walkers from the firm’s Aberdeen and Inverurie offices laced up their boots to take part in the Aberdeen Kiltwalk on June 4 in aid of Macmillan Cancer Support, The Celtic FC Foundation and Cancer Research UK, along with other local charities. Together, they raised just over £5,500, with donations to other charities set to be buoyed by fundraising from the Johnston Carmichael teams in Glasgow, Edinburgh, and Tayside. The accountancy and business advisory firm, gold sponsor of this year’s Royal Bank of Scotland Kiltwalks, has 11 offices across Scotland, with premises surrounding each of the four Kiltwalk routes; and staff have been training hard, ready to don their tartan and raise money for local and national charities in the areas where they live and work. Graeme Fraser, audit partner in Aberdeen, has individually raised a further £500 after pledging to complete both the Aberdeen and Edinburgh Kiltwalks. Johnston Carmichael’s Aberdeen managing partner Niall Farquharson, said: “There were some sore feet on the day, but the pain was worth it. We are very proud of our association with Kiltwalk and its fundraising efforts, for a range of causes. 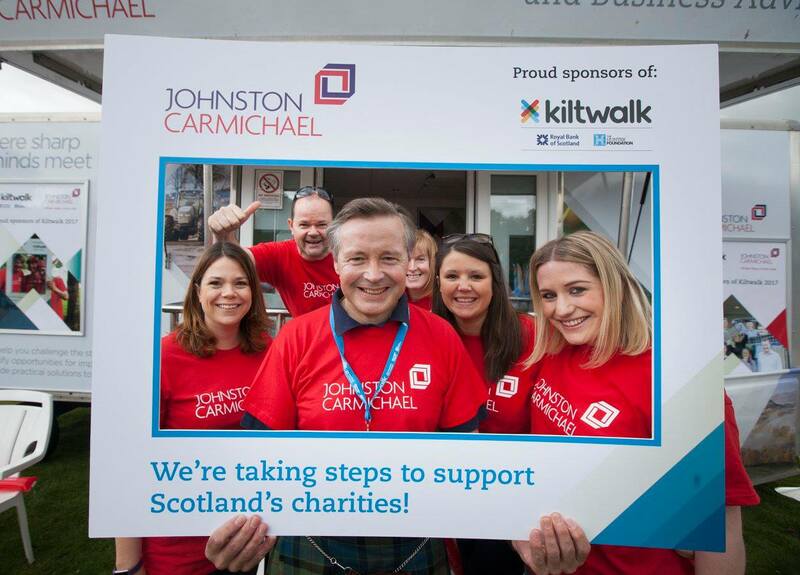 As a business, Johnston Carmichael are committed to contributing to and supporting the communities in which we live and work, so we’re urging our staff to raise as much as they can for each event. With almost 700 staff and partners in our business, we can really make a difference and it is truly rewarding to know that every step we take will help to transform lives. For the first time ever, the Kiltwalk is open to all charities, enabling walkers to raise money for any cause close to their hearts. With Kiltwalks in Dundee (August 20) and Edinburgh (September 17) still to come, funds raised by the Kiltwalk since it began in 2011 could reach £5 million.